I've always wanted to be one of those women who carried perfume. 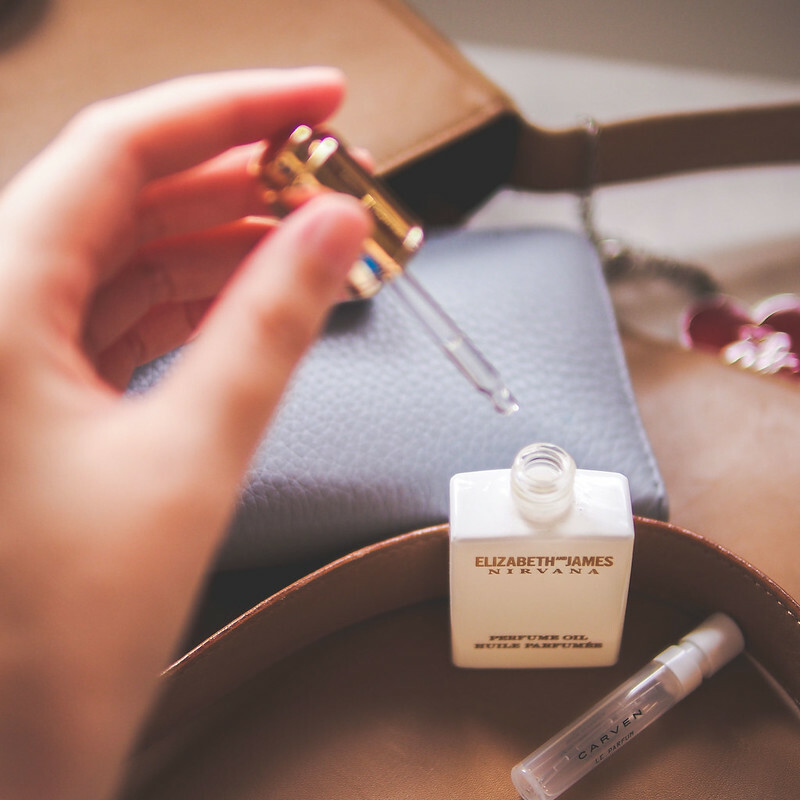 A little vial stashed in a handbag and carefully reapplied while freshening up in the powder room; there's something charming and most romantic about it. 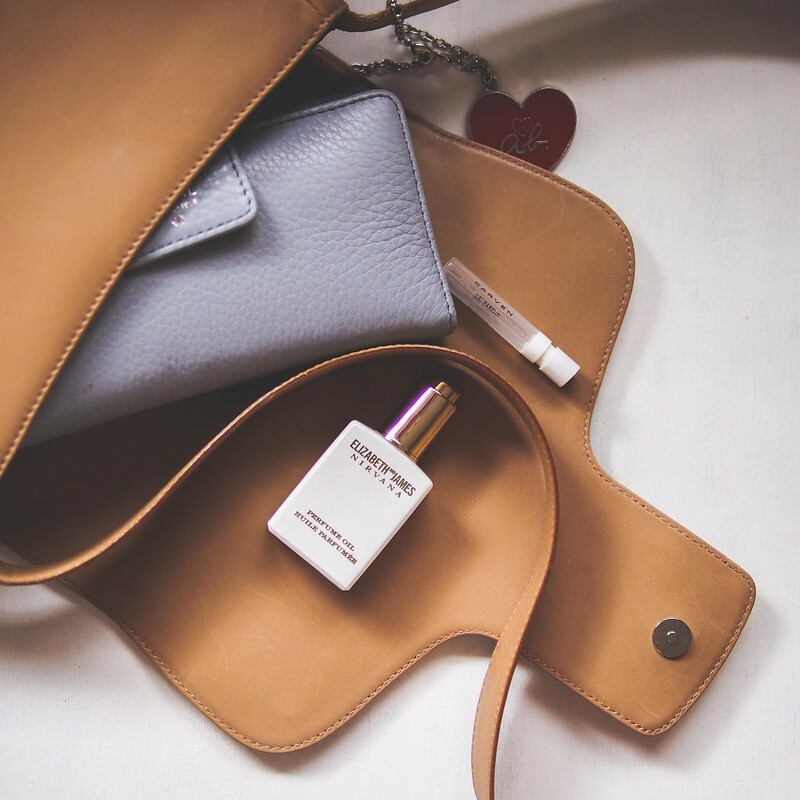 But while the perfect fragrance is up for debate, the universal problem that looms over this situation is how to discretely yet stylishly travel with your fragrance? Even with my growing collection of roller ball options, they're still not my ideal product as the more you roll, the more dirt and other floaters somehow always end up inside the tube. Lately, I've been toting around this delicate miniature bottle of Nirvana White* from Elizabeth and James. Holding around 14ml in a drop dispenser bottle, this is actually a perfume oil that you can apply to your skin or even hair all without making a fuss. Distinctively peony, White has a sweet presence that's balanced by a slight musky under note and a touch of green from lily of the valley that makes a beautiful young daytime scent or even better when layered over something slightly stronger. The oil format is easy to reapply (as in, not dousing everyone else around you) but I also find it wears closer to the skin compared to the spray version which is great if you work in close quarters with others. Alternatively, I've also been rationing my sample via of Le Parfume by Carven... a floral mix of mandarin blossom, jasmine, ylang-ylang which settles with a hint of patchouli lingering on the skin. Completely out of my comfort zone, the subtly bitter tinge of patchouli brings a grown up quality to an otherwise heady cocktail. In fact, I can mostly definitely see a full bottle of this in my future (just you wait until September) and it makes for a great signature fragrance for someone who's young at heart but still want a classic aura. But for hiding inside even the smallest clutch, this sample vial does its job perfectly. In fact, I can get in a discrete spritz even on the bus... you know, just in case you catch someone's eye as your make your exit. Let me know what you've been wearing this time of the year and how you like to carry our perfume?